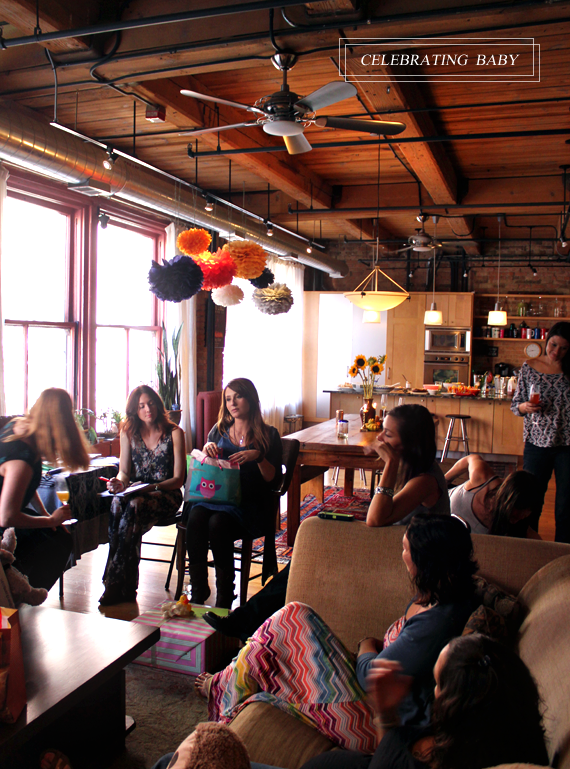 This past Sunday, my friends threw me a baby celebration party at my dear friend Rachel's gorgeous downtown apartment. I've helped Rachel throw showers for a couple of our other friends, and let me tell you - she is one crazy talented party planner. So when she approached me about hosting one for me, I was both touched and thrilled. 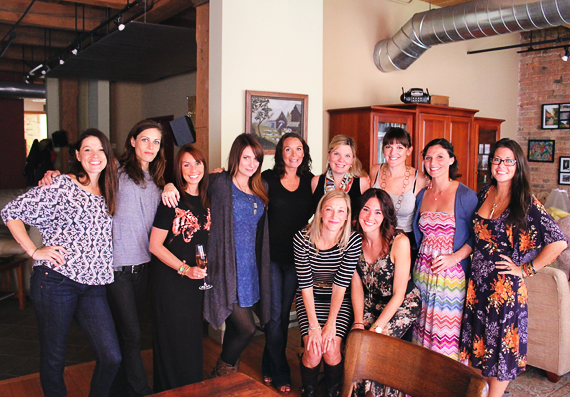 My family is planning on throwing a more traditional shower later this month, but getting to have a special party with just my girlfriends meant the world to me. Walking into Rachel's place and seeing the beautiful fall-themed shower decor, the delicious array of food and treats, and so many of my closest friends gathered to celebrate our little girl brought me to tears. (Tears may or may not have happened on several occasions throughout the day, if we're going to be totally honest here.) We listened to music, ate the yummiest food and treats, talked, laughed, told stories, opened gifts, had craft time, and just hung out. It was a super rad party (hence the title of the post) and such a memorable day, and I just had to share some bits and pieces with you guys. The attention to detail was impeccable when it came to the decor - everything was warm and inviting and perfect for the season. 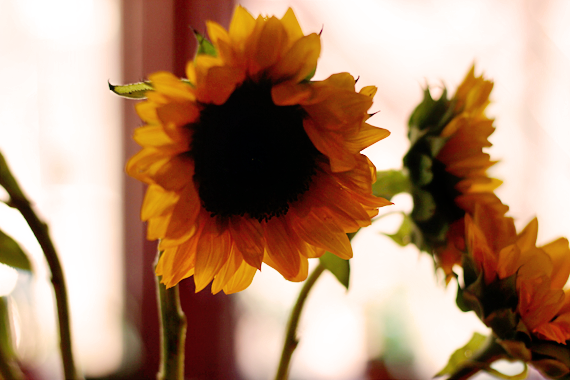 There were fresh flowers (including sunflowers, one of my very favorites) placed throughout the apartment, along with gourds, mini pumpkins, and fall candles. 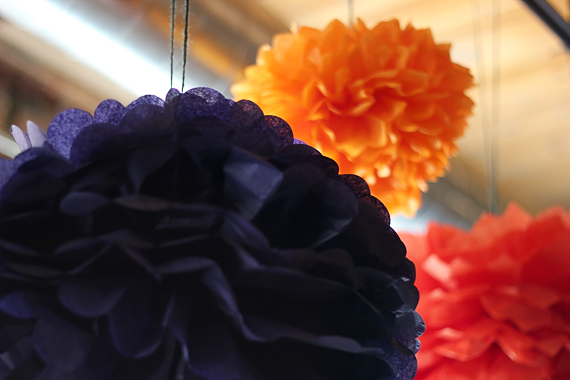 Pretty handmade tissue poms in autumn shades hung from the ceiling. There was even a blown-up, framed picture of baby's most recent ultrasound. So, so sweet. The food was vegetarian and homemade by Rachel and other friends, and featured everything from a to-die-for zucchini and ricotta galette, to quinoa and corn salad, to individual glasses filled with hummus and veggies, to ridiculously decadent mini organic pumpkin doughnuts (yes, they were as good as they sound). There were apple cider mimosas and orange sparking water drinks too. My dear friend Melch (you might remember her from the surprise baby shower we threw for her back in April) couldn't make it out from Charleston (she has a new baby of her own now!). That didn't stop her from helping with some of the details of the shower though, including these clever favors: colorful nail polishes with ribbons tied around them. 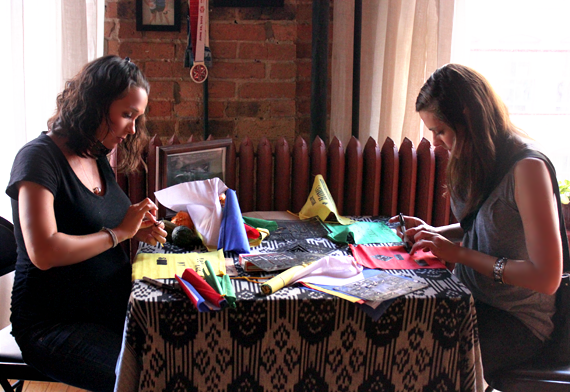 One of the coolest parts of the party was the DIY craft activity. 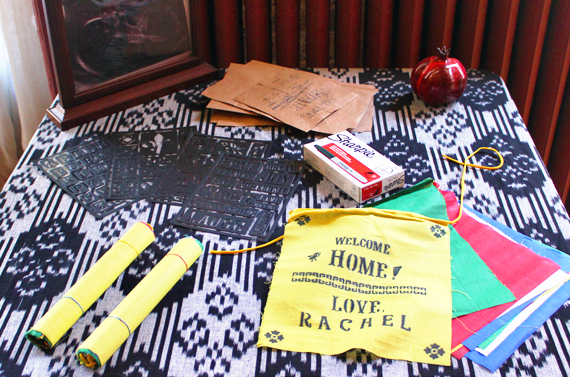 Rachel bought a few sets of blank Tibetan Prayer flags, stencils, and markers, and each guest put special messages on them welcoming baby. This idea is so unique, and is also very sentimental to me. I lived at at Tibetan Buddhist center for three years and Tibetan Buddhism holds a special place in my heart (and on my body in the form of tattoos! ), and this will be such a fantastic way to bring a little bit of that into our baby's nursery. One top of that, the colors are perfect - we are doing the nursery in white and grey with details in the same vibrant colors of the prayers flags. It really was an incredible day that I'll never forget. I am so, so grateful to have such a wonderful group of friends, and to have such a special memory to be able to share with my daughter someday. Thanks for letting me share some of it with you too! 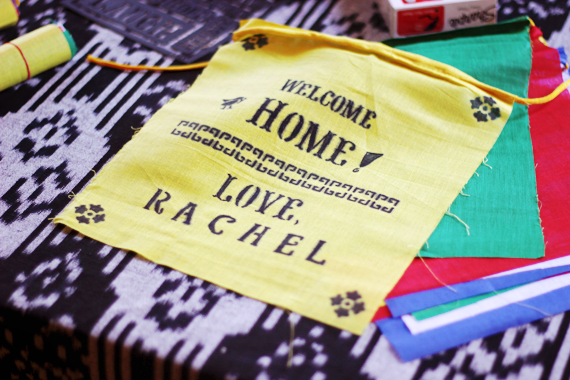 Looks amazing, the prayer flag idea is incredible. 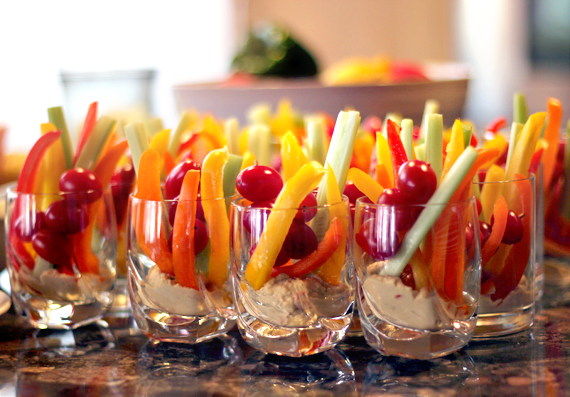 The glasses with the yummy veggies look great too! Definitely rad :) Congratulations. What a beautiful celebration!!! So many unique ideas and such pretty design!! Girlfriends are the best, your little girl is gonna be so loved!! I'm glad you had such a fun day with your friends. You still look great, too! 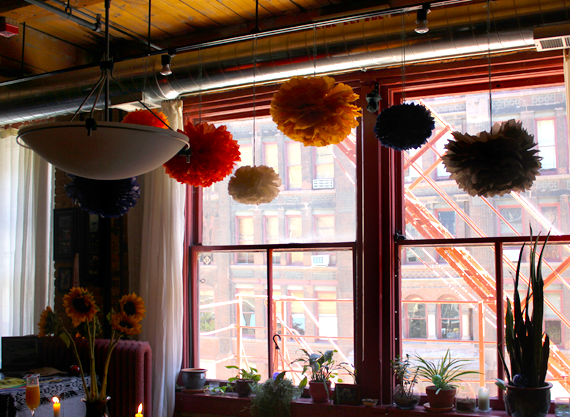 Love the hanging flower decorations! & Congrats! I'm stopping by from Blogging Buddies & I also wanted to invite you to a Blog hop called "The Great Blog Train" currently on my blog & there's a great Giveaway also! What a wonderful day! Her apartment is so awesome and all the decor is beautiful! 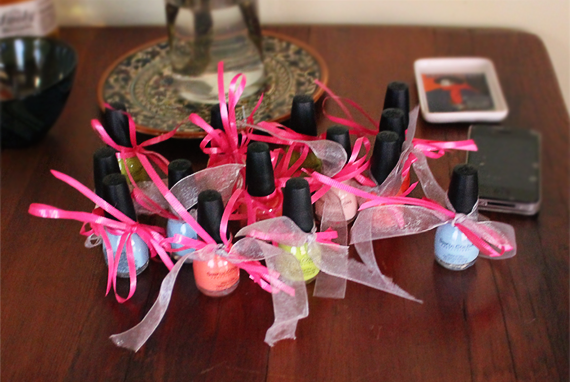 I love the idea of nail polish for a favor and what a special touch to have the handmade prayer flags made by guests! Beautiful!!!!!!!!! You are so loved, mama! What a special day of honoring you and lil miss!! <3! 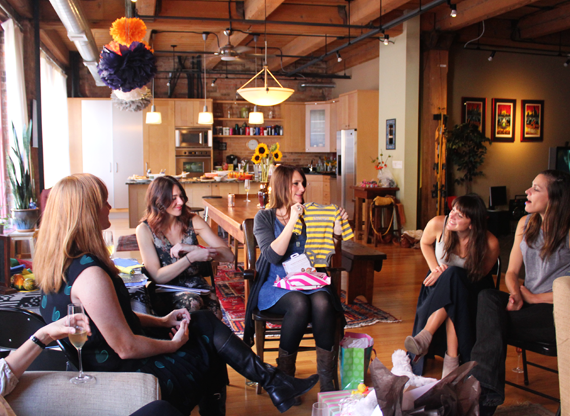 Aw, firstly you look absolutely gorgeous and what a rad baby shower indeed. I love all the details + the food looks so good. Mmmmm! ;) And that is one heck of an apartment... I'm totally smitten with it!! This looks like a beautiful party! The Buddhist flags are such a lovely idea! It looks amazing, and I'm so glad you had a great shower. All that food looks and sounds delicious too. 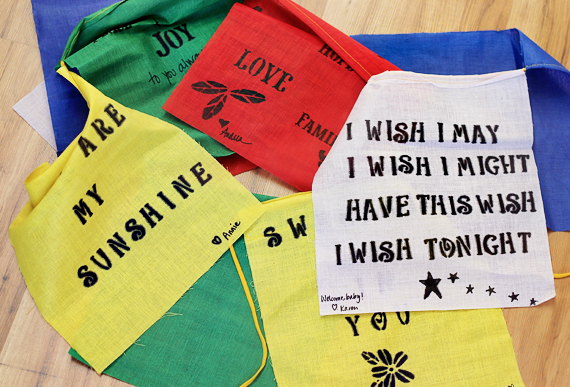 i love the prayer flag idea. looks like a really fun unique shower. Your shower looks amazing! The food and decorations add a wonderful charm. You have great friends! so cute! I wish i could have been there to give you a big hug and a present sis! i can tell that every detail was well thought out and tailored just for you, dear melissa! 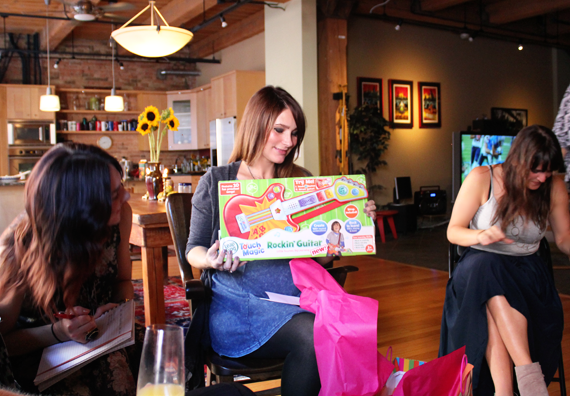 i noticed the gifts were wonderful for your little girl too. 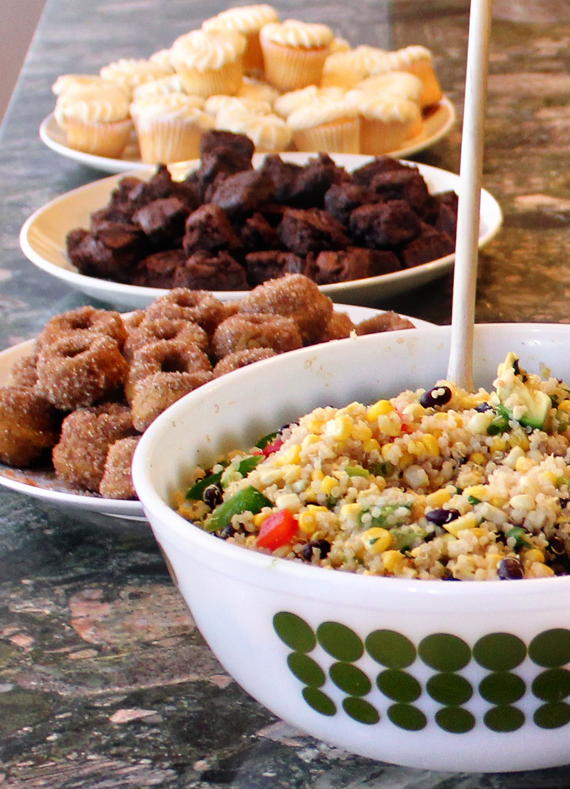 the food looked heavenly, and the activities sounded fun. aren't good friends the best? 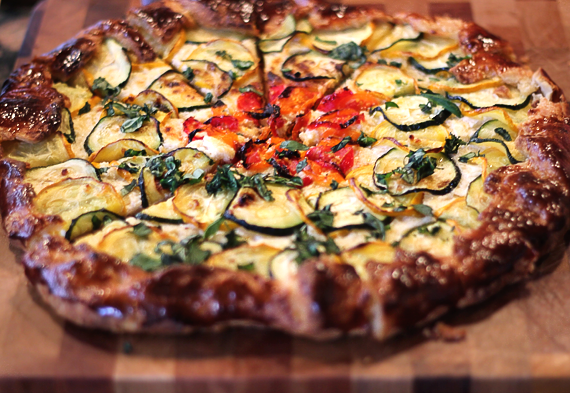 That zucchini galette looks so good. Yum! Thank you all so much for your comments and for letting me share this special day with you!